This is the beginning, it takes a long time for me to figure out how to create this site and if should be a good idea do it. But after some indecisions and a lot of experimentation on formats, layouts and design, finally my home page is up and running. Why create an own site and domain instead to use a page on Facebook or Instagram? In simple words, because I want a place where I can decide about format, content, and my policies and terms. I will continue to use Instagram, 500px, Twitter, Facebook and others; there is no chance to win alone in the Internet, but I need a place to experimentation, to share my thoughts and maybe make some mistakes. To start this blog, I present an image captured on a business trip to San Francisco in Oct/2015. 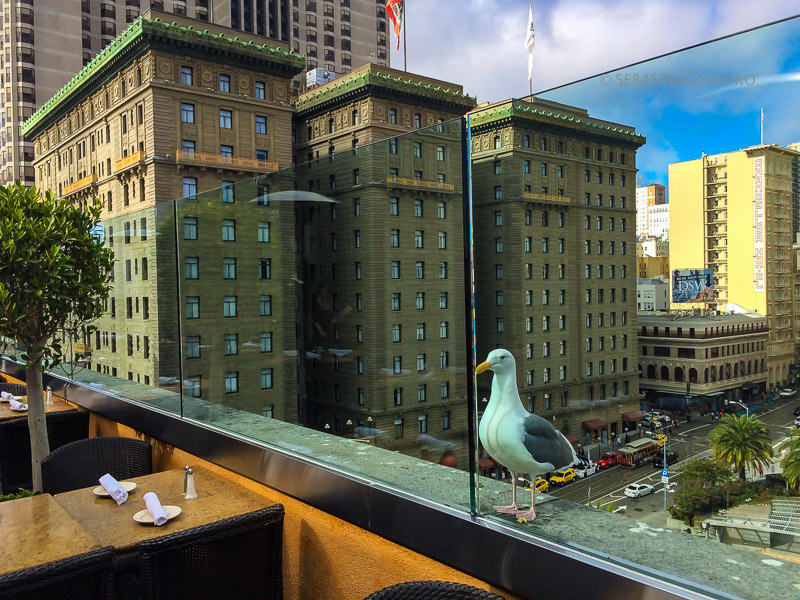 We were in a terrace during the lunch time and I noted the seagull outside the glass looking inside, probably knowing that someone could seat on the tables and share some food. Hopefully I was with iPhone in hands and ready to use it. This photo was selected and published on NatGeo Your Shot site as one of Daily Dozen (Nov, 30/2015).